These cupcakes are made from a doctored up cake mix. 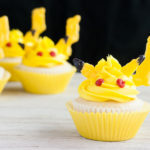 Topped with homemade buttercream icing with Pikachu shaped ears, tail, and red cheeks. Add Red coloring gel and mix until you get the desired color. See instructions written in the post. Make sure to add shapes while icing cupcakes.